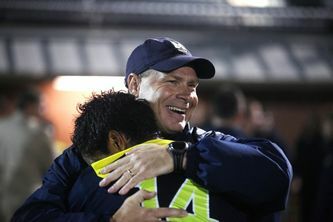 Posted on Wed, Nov 30, 2011 : 10:29 p.m.
Steve Burns has resigned after 19 years with the Michigan men's soccer program, the university announced Wednesday. Burns is the only head coach the Wolverines have had since the team was elevated to varsity status in 1999. He coached the Michigan club team since 1992. "As a Michigan alum, I'm proud of everything we've been able to accomplish within the soccer program," Burns said in a statement released by the athletic department. "I will forever cherish the relationships that I have developed over the past 12 years with players, assistant coaches, support staff and fellow coaches within the department. However, it's time for a new direction in my life and leadership for Michigan soccer." After a program-best season in 2010 -- the Wolverines won the Big Ten Tournament title and reached the NCAA College Cup semifinals for the first time -- the Wolverines struggled to a 5-14-1 record in 2011. "We appreciate Steve's efforts on behalf of the University of Michigan," said athletic director Dave Brandon. "Steve has been a valuable member of the men's soccer program since its inception and we wish him well in his future endeavors." Michigan will begin a search for Burns' replacement immediately, the athletic department says. Sat, Dec 17, 2011 : 4:18 p.m.
What an incredible shock to learn that Coach Burns has left. He was a stellar coach with integrity and kindess to this entire community. What a loss. Fri, Dec 2, 2011 : 4:11 a.m.
Thu, Dec 1, 2011 : 5 a.m.
We'll all miss you Steve Burns. Though this year was not what you hoped for, we will always remember that great run last year; we will remember that you brought soccer from club sport to elite NCAA team, and we will remember what an ethical team guy you are/were. Thanks for your hard work. Go blue! !